Am I required to provide workplace CPR classes? 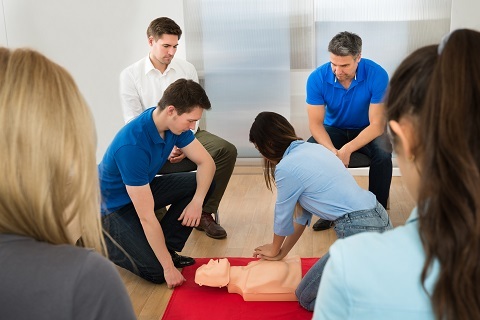 Thus, certain states – or individual business owners – have taken it upon themselves to craft more specific criteria around which businesses or entities should receive formal workplace CPR classes. If you’re a business owner in Virginia or North Carolina, legal compliance around workplace CPR training is more detailed. After a comprehensive analysis of statewide EMT response times governing bodies of these state found that average response times in most cases did not meet criteria for the response times listed by OSHA. Or, legislators felt there was too much wiggle room for translation if and when a workplace injury or fatality resulted in a lawsuit. Hospital and medical personnel, including lab technicians and office personnel who work in a hospital or medical setting. Law enforcement, firefighters and EMT or first responders. This might also include front house staff of these entities in case a civilian enters the building in some sort of physical distress. Those who work with children, including teachers, school personnel, coaches, daycare workers, nannies and so on. Failure to comply with regulations could cost your business – or its employees, a license to practice or perform their job responsibilities. You may find consideration of OSHA regulations and statewide amendments lead to a restructuring of your company’s first-aid program. While your company’s willingness to reimburse employees or cover the cost for their CPR, AED and/or first aid certification is well-intentioned, it leads to extra costs in the end. Lost work time, transportation, meal credits and adding “one more thing” to a busy’ employee’s To-Do list can impede the process. Plus, who’s taking the time out to track certifications, renewal deadlines and expiration dates? That becomes another time and labor consumptive task. OSHA also recommends,”Employers should make an effort to obtain estimates of EMS response times for all permanent and temporary locations and for all times of the day and night at which they have workers on duty, and they should use that information when planning their first-aid program.” There’s another time-consumptive effort to contend with. Onsite, Corporate CPR training offers an affordable and effective solution. In just a few hours, employees can be brought into compliance and there’s no need to worry about emergency response times, expiration dates or renewals. One session, scheduled every year, ensures your company and its employees are covered.